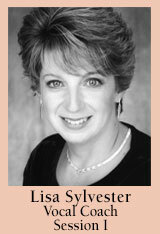 Lisa Sylvester, coach/pianist/conductor, is on the faculty of the University of Southern California’s Thornton School of Music, where she is a vocal coach and teaches courses in Diction and Song Literature. She has also been on the faculty of OperaWorks, summer training program for singers directed by Ann Baltz. Sylvester has long been associated with the acclaimed Long Beach Opera where she has served as assistant conductor/orchestral pianist on numerous twentieth century operas by composers such as John Adams, Philip Glass, Leos Janacek, Alejandro Golijov, among others. She has given presentations for the L.A. Opera’s Community programs and served as music director with L.A. Opera Young Artists in workshop performances of Anthony Davis’ new opera, Revolution of Forms. Together with John Duykers, tenor and Melissa Weaver, director, Ms. Sylvester collaborated in the Opera/Theater Performance Project class at the California Institute of the Arts (1999-2004) where they produced five composite-opera/theater works. Also with Duykers and Weaver, Sylvester served as assistant conductor for two world premieres produced by First Look Sonoma: Caliban Dreams by Clark Syprynowicz in 2011 and Daughter of the Red Tsar in 2012 by Lisa Scola Prosek. Sylvester and Duykers have also created and presented the “Instant Opera Pastiche” workshop at the National Opera Association’s National Convention, the Riverside Opera Institute and the National Association Teachers ’of Singing Regional Meeting in Las Vegas. Most recently, Ms.Sylvester co-created and served on the faculty of the four day seminar “LA Vocal Lab” and also coached young singers in a week-long workshop at the Cornish Summer Arts Institute in Seattle.